This tangy stir fry recipe features your choice of seafood in combination with mango. Shrimp, fish fillets, mussels, clams, scallops, etc. can all be used, or choose just one or two, then stir fry them together with snow peas and red pepper in a sweet and sour sauce that marries perfectly with fresh mango (or you can use frozen or canned mango if you can't find fresh). An easy and scrumptious stir fry recipe that is sure to a hit with everyone at your dinner table! Place all stir-fry sauce ingredients together in a blender or food processor. Process or blend until smooth. Taste-test the stir fry sauce for sweetness. You want a balance of flavors here, tangy, but definitely more sweet than sour. If needed, add 1 teaspoon to 1 tablespoon more sugar. 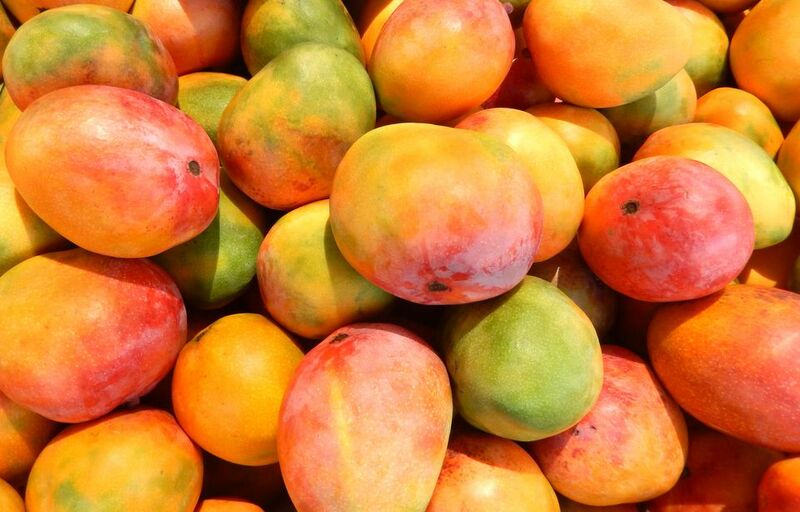 Note: the sweetness of the sauce will depend on how sweet your mangos are. Prepare all other ingredients for stir-frying, and place next to the stove. If using fillets of fish, gently cut them into cubes (cubes stay together better than strips). For shrimp, be sure to remove the shells (you can leave the tail on). For clams and mussels, rinse with cold water, removing any surface debris. Pour 1 to 2 tbsp. vegetable oil into a wok or large frying pan and place over medium-heat heat. Add the garlic, shallots/onion, and snow peas. If using clams, add them now as well (Note: clams require a longer cooking time than mussels). Stir-fry 1 to 2 minutes, or until snow peas turn bright green. Add up to 1/3 of the stir-fry sauce when your wok or frying pan becomes dry. Add the rest of the stir-fry sauce, plus the red pepper and seafood. Stir-fry gently, so that you don't break any shells. Also, if using fish fillets, these require extra gentleness, or they will break apart. Stir-fry 5 to 7 minutes, or until all the seafood is cooked (mussels and/or clams should open after 7 minutes, if not, discard). A minute or two just before serving, add the mango pieces (these just need warming). Serve hot from the wok with rice on the side. Or, scoop the stir-fry onto a serving platter. Sprinkle with fresh cilantro and decorate with lime wedges, if desired.